Of the many kinds of restaurants that are available in Negombo, fine-dining seafood is amoung the rarest. Keeping this in purview, Amagi Aria Hotel, located along the Negombo lagoon, debuts on an exciting journey with its seafood restaurant, aptly named Moyã. The restaurant takes its name from the Sinhalese term for the place where the lagoon meets the sea, an ideal representation for the venue that is designed around the succulent delicacies available in the seas around Sri Lanka. Offering a cultural fusion of the food and flavours that pay homage to Negombo’s social and culinary history, Moyã is the very first of its kind to venture into Negombo’s dining scene. The restaurant is open daily for dinner service from 7 p.m. to 11 p.m. In addition, Moya offers fine dining in a setting like no other. Located atop the new 7-storey wing of Amagi Aria, the restaurant is wrapped in floor-to-ceiling windows so that guests can enjoy panoramic views of the Negombo lagoon and fauna, including the occasional fishing boats making their way along the serene waters. The restaurant seats approximately 110 guests (70 indoor and 40 outdoor) and features a live kitchen, seafood display and bar. The setting is a refined, relaxing space for guests to enjoy expertly created drinks handcrafted by talented bartenders, the freshest, most delicate and impeccably sourced seafood prepared to perfection, providing a total seafood experience. The restaurant’s menu includes a full array of seafood specialties including lobster, crab, mussels, prawn, squid, salmon, tuna, flavoured to suite any appetite. 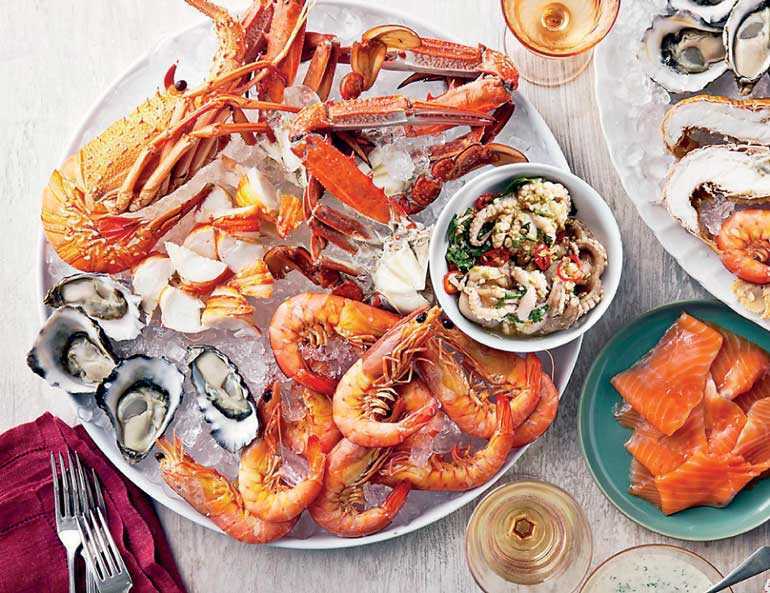 Amoung the starter highlights include Chilled Scallops, Fried Hot Calamari, Ceylon Black Pepper Crusted Yellow Fin Tuna Tataki, Marinated Lagoon Prawn Caesar Salad, Healthy Life Sashimi, Oysters and Mini Fried Crab Cake. Main features include Green Mussels, Clam and Sausage Stew, Grilled Salmon, Steamed Modha, Tuna Wrap, Tempura Prawn and Hot Butter Calamari. In addition, individual preferences include Crab Melt, Spicy Wok Fried Crab, Monster Baked Crab, Ginger Crab, Wok Tossed King Prawn with Scallions, Lobster Hollandaise, Tikka Marinated Lobster, Jinga Prawns, Singapore-style Fish Head Curry, Mixed Seafood Platters and many more. To finish, Moyã’s signature desserts include decadent classics such as Mango Panacotta with Mixberry Coulis, Fruit Pavalova with Whipped Ganache, Crème Brûlée, Triple Ice Cream (Cinnamon/Wood apple/Vanilla), Lemon Mint Sorbet and Coconut Parfait Cinnamon Crumble. Amagi Aria is offering a fantastic 50% discount on your food bill at Moya (excluding lobster) during the month of July, and in August you can enjoy a 50% discount on all crab dishes too. Discover a meticulous balance of flavors and textures, taken to new heights by the skilled team of chefs at Moya – Amagi Aria. Experience seafood dining at its best; make your reservations by calling 031 2238385-8.